A thunderous third quarter performance helped Australia retain their grip on the Cormac McAnallen Cup this afternoon at Croke Park with a 69-31 victory, although this sold-out second Test will be remembered for other reasons. The Aussies secured their fourth International Rules series win in the last five years, claiming a 109-79 aggregate triumph. But the violent scenes which marred today’s first quarter will surely reopen the debate as to whether this is a viable way for Ireland’s top Gaelic footballers to compete on an international stage. The hybrid game has always had its detractors, and the heavy-handed tactics that Kevin Sheedy’s victors deployed in front of 82,127 Croke Park spectators – a record crowd for an international fixture held on Irish soil – will only add to their number. It was Melbourne 2005 revisited as the Aussies deliberately set out to target Ireland’s key players – Graham Geraghty (concussion), Tadhg Kennelly (groin) and Shane Ryan (back spasms) were all on the receiving end of blows. A ferocious first quarter, which saw seven players yellow carded and a breakout of brawls all over the pitch, saw the Aussies rocket into a 16-1 lead. Chance Bateman, who was making his International debut, clashed with Kerry’s Paul Galvin before the throw-in and both were yellow carded. Referees David Coldrick and Shane McInerney were struggling to keep a lid on things, as evidenced by Australia’s third-minute goal when Brent Stanton dinked the ball into the top left corner of the net when all eyes were still on a bout of fisticuffs, 50 metres downfield. Overs from Aussie captain Barry Hall (2) and Daniel Pearce raced Kevin Sheedy’s men clear, with newcomer Nicholas Murphy’s second-minute behind Ireland’s only score amidst a torrid opening. Kerry defender Aidan O’Mahony, Irish skipper Kieran McGeeney and Australia’s Brett Peake, Nick Davis and Adam Selwood were all sent to the sin-bin in a first quarter which ended 16-10 in the holders’ favour. 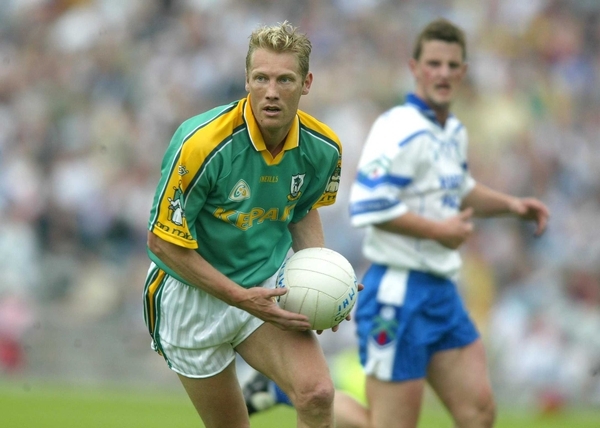 Proceedings were held up for six minutes while Meath forward Geraghty, who was always going to be targeted after his first Test involvement with Lindsay Gilbee, was put onto a stretcher after being dumped in a tackle and sustaining a concussion. Ireland rallied towards the end with overs from Benny Coulter, who was on the end of a flying elbow from Selwood, Alan Brogan and Dermot Earley. However, for the remaining three quarters – 54 minutes – Sean Boylan’s Irish side could only add four more overs (or ‘points’ in Gaelic football) as they left their kicking boots in the dressing room. It was a woeful display of shooting from the country’s elite forwards – one that would leave even the lowliest of club managers scratching their heads. Against that, the Australians, when they forgot about the physical element, showed some excellent footballing skills with Daniel Pearce, Hall, Justin Sherman and Ryan O’Keefe, their first Test top scorer, to the fore. In the second quarter, the Irish hit just one over, from a Steven McDonnell chip that bounced off the crossbar, and three behinds as Sheedy’s side, despite having Hall sin-binned, led 27-16 at half-time. The Australians’ superior fitness showed in the third quarter as they struck two goals, five overs and three behind – 30 points – to a single over (from Brogan) and one behind – 4 points – from their hosts. The tactic of taking long kick-outs was backfiring on Cork keeper Alan Quirke and two goals in the space of four minutes helped kill off the game. Aaron Davey broke through on 45 minutes to shoot off the post and the lurking Brendon Goddard scooped up the loose ball to beat Quirke from close range. A high ball caused commotion in the Irish defence in the 48th-minute and a neat lay-off from O’Keefe, who starred in both defence and attack, allowed Ryan Crowley enough space to crash home Australia’s third goal. Ireland’s 48-40 win in Salthill last week seemed a distant memory as the Aussies ended the third quarter 57-20 in front. Boylan’s charges made a brief rally at the start of the fourth quarter when Earley, Brogan and O’Mahony grabbed overs but it was goals they needed – in fact this was the first ‘home’ Test since the Rules series was rekindled in 1998 that an Irish team had failed to score a goal. Spectators began to file out of GAA headquarters towards the end of the third quarter. Pearce and the talismanic Hall, who struck two overs in quick succession to run his tally to four, completed the rout with easy overs in front of Hill 16. IRELAND: Alan Quirke (Cork), Marc O Se (Kerry), Anthony Moyles (Meath), Sean Marty Lockhart (Derry), Tom Kelly (Laois), Kieran McGeeney (Armagh) (capt), Aidan O’Mahony (Kerry), Tadhg Kennelly (Sydney Swans/Kerry), Colm Begley (Brisbane Lions/Laois), Paul Galvin (Kerry), Nicholas Murphy (Cork), Sean Cavanagh (Tyrone), Steven McDonnell (Armagh), Graham Geraghty (Meath), Benny Coulter (Down). Interchange: Paul Barden (Longford), Joe Bergin (Galway), Alan Brogan (Dublin), Dermot Earley (Kildare), Karl Lacey (Donegal), Kevin Reilly (Meath), Shane Ryan (Dublin). AUSTRALIA: Dustin Fletcher (Essendon), Barry Hall (Sydney Swans) (capt), Michael Voss (Brisbane Lions), Andrew Raines (Richmond), Ryan O’Keefe (Sydney Swans), Brendon Goddard (St Kilda), Justin Sherman (Brisbane Lions), Matthew Lappin (Carlton), Adam Schneider (Sydney Swans), Ryan Crowley (Freemantle), Danyle Pearce (Port Adelaide), Chance Bateman (Hawthorn), Brett Stanton (Essendon), Aaron Davey (Melbourne), Adam Selwood (West Coast Eagles). Interchange: Nick Davis (Sydney Swans), Kade Simpson (West Coast Eagles), Brett Peake (Freemantle), James MacDonald (Melbourne), Campbell Brown (Hawthorn), Graham Johncock (Adelaide), David Mundy (Freemantle). Referees: David Coldrick (Ireland), Shane McInerney (Australia). IRELAND: Dermot Earley 7 (0-2-1), Alan Brogan 7 (0-2-1), Steven McDonnell 6 (0-2-0), Benny Coulter 4 (0-1-1), Joe Bergin 1 (0-0-1), Paul Galvin 1 (0-0-1), Kieran McGeeney 1 (0-0-1), Anthony Moyles 1 (0-0-1), Nicholas Murphy 1 (0-0-1), Aidan O'Mahony 1 (0-0-1), Marc O Se 1 (0-01). AUSTRALIA: Barry Hall 14 (0-4-2), Brendon Goddard 9 (1-1-0), Justin Sherman 9 (0-3-0), Ryan O'Keefe 7 (0-2-1), Danyle Pearce 7 (0-2-1), Ryan Crowley 6 (1-0-0), Brent Stanton 6 (1-0-0), Aaron Davey 4 (0-1-1), Nick Davis 3 (0-1-0), Chance Bateman 3 (0-1-0), Own behind (Moyles) 1 (0-0-1).